[Quebec City, June 26, 2018]–With three trips in rapid succession in June I feel on the verge of a “What I Drank for My Summer Vacation” essay. Not that any of the trips can really be categorized as vacations. I traveled down to Gulf Coast of Alabama early in the month for golf media trip. But as with any trip I’m on, there will be beer. That was quickly followed by a media trip to Grand Rapids, Michigan, and there the focus was golf and beer. 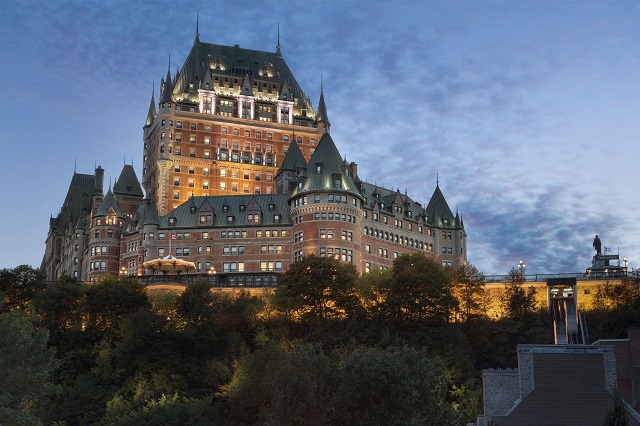 And now I’m in Quebec City, working on an assignment about the 125th anniversary of Fairmont Le Chateau Frontenac by staying two nights in the hotel (pictured above). Not a bad geographic spread, a decent vantage point for a Think Globally, Drink Locally mindset. The obvious on-the-ground evidence in my travels is that craft beer mania now knows no geographic bounds. This is especially true in the U.S. south, which was still so deep, early in the 21st Century, that it was submerged in a sea of Bud Light and other watery mass market lagers. Remnants of Prohibition clung to many southern states like moss on a live oak. But the times and regulations that once inhibited new brewing are at last a-changing, and nowhere is this more evident than in Alabama, which had but a few drops in the craft beer barrel as late as 2011. 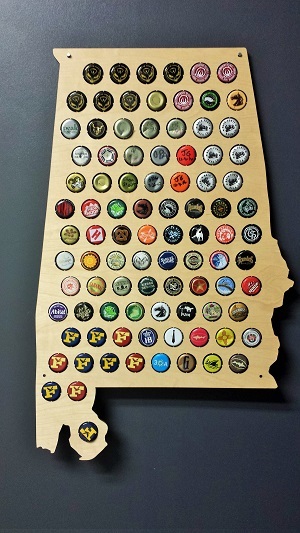 According to the Brewers Association, keepers of craft beer statistics, Alabama became the fastest growing craft beer state in the nation over the next five years, surpassing 60,000 barrels, a growth rate of a nifty 6,380%. I also went to Alabama last year—just as the Doug Jones-Roy Moore campaign lit its fuse—and was pleasantly surprised as perhaps only a damn Yankee could be at the both the profusion and proficiency of the breweries in the northern part of the state. Traveling south this spring I cracked open more cans from breweries in or near Birmingham and Huntsville, but we got local when we rolled through Fairhope (Fairhope Brewing Co.) and Mobile (Haint Blue Brewing Co.). 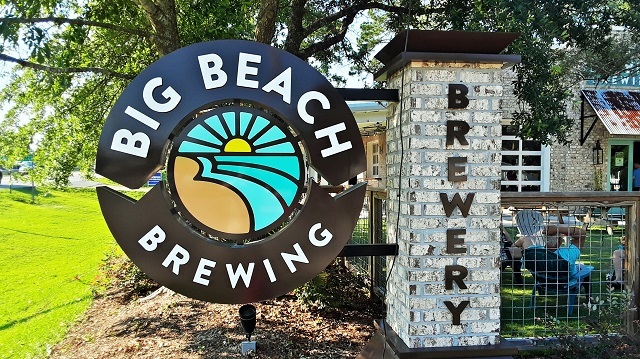 We got lucky on a visit to the Big Beach Brewing Co., the state’s southernmost brewery and the only one, so far, in Gulf Shores, part of the 36-mile peninsula separated from the mainland by the Intracoastal Waterway. Every Thursday is Firkin Day at the family-friendly Big Beach, meaning they tap a special small batch brew and serve it till it runs out. This particular evening it was a rich and creamy 8.2% ABV Imperial Milk Stout called Bushwacker and we stayed until it did, indeed, run out. Grand Rapids, Michigan, clearly tilts Republican. 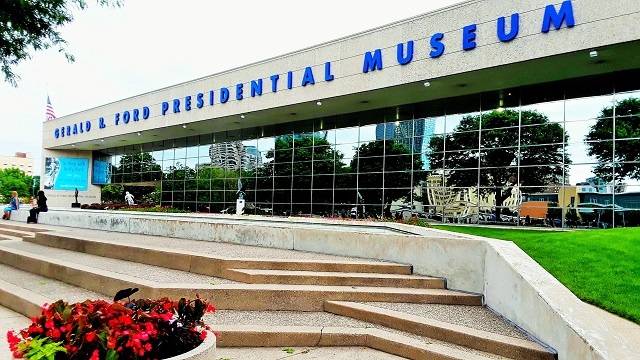 This is Gerald Ford’s hometown, after all, site of Gerald R. Ford Presidential Museum, and the resting place for the late President and Betty Ford. The group I was with also stayed at the Amway Grand Plaza, a classic old hotel refurbished by the Amway Corporation, which has its headquarters nearby and happens to be the source of the DeVos family fortune. So Betsy DeVos at least gets credit here in the state’s second-largest city (just under 200,000 population) for spreading the wealth locally; the family name is all over a revitalized Grand Rapids—the DeVos Convention Center, the DeVos Performance Hall, or the DeVos Learning Center at the Presidential museum. But the tourism office had invited us along to experience Grand Rapids as Beer City USA. There are over 80 breweries in the greater Grand Rapids vicinity and 12 in the city proper, and after visits to most of the latter in three nights we were in no condition to argue. Some of the breweries began elsewhere in Michigan before establishing outposts in Grand Rapids—New Holland in Holland, Jolly Pumpkin in Dexter, Atwater in Detroit. Others are wholly home-grown: City Built Brewing, Grand Rapids Brewing, Harmony Brewing, Creston Brewery. All seemed lively on the mid-week evenings we visited, many promoting game nights (speed euchre in one spot, team beer pong in another), and offering an impressive roster of lagers as well as ales. While it’s clear that golf didn’t impinge on my beer drinking, I can’t swear to the reverse. 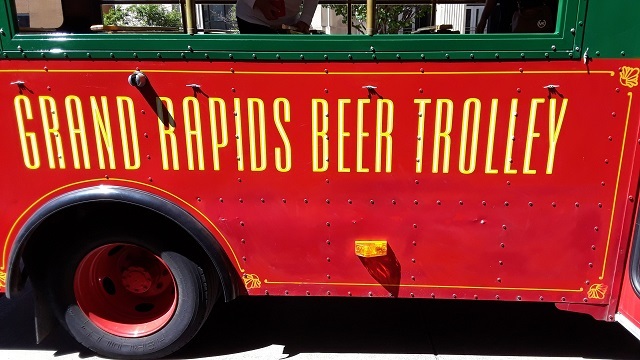 I know I wasn’t at my sharpest for my last round, after many rounds the night before thanks to a ride on the Grand Rapids Beer Trolley. 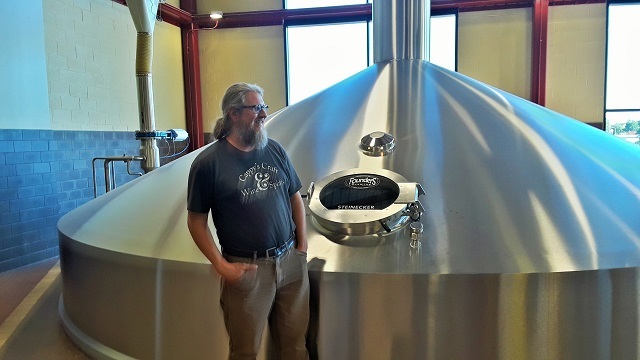 This fashionable designated driver squired us around to three brewpubs before stopping at Founders, not only the major player in Grand Rapids but the largest brewery in Michigan and the ninth largest in the nation. Founders co-founder Dave Engbers said the brewery expected to produce 620,000 barrels in 2018, 60% of them filled with the enormously popular All Day IPA, readily available in Vermont. Four years ago Founders sold a 30% share of the brewery to the Spanish beer company Mahou San Miguel. According to standards established by the Brewers Association, that lifts Founders out of the craft beer category. Engbers said he didn’t give a hoot, though he said it more colorfully. For their 50th anniversary in 1987 my parents took the entire family on a Saint Lawrence River cruise—me, my brother and sister and our respective spouses. One of the stops was in Quebec City, and once on the ground all four couples went their separate ways, expecting to meet back on board ship. But after making the rounds of this most ingratiating of cities, Lynn and I decided to head to Le Chateau Frontenac, a beacon overlooking the old town in its imposingly palatial splendor. We made our way to the bar, where we ran into my parents. Before too long my brother and his wife arrived. And eventually, my sister and her husband, too. We’re a spirited family, what can I say? Here in Quebec City I’ve enjoyed some beer from the Archibald Microbrasserie in Lac-Beauport, about 15 miles north, and a cask Rousse anglaise (a 5% ABV English bitter) at La Barberie, a brewpub that has been around for 21 years. 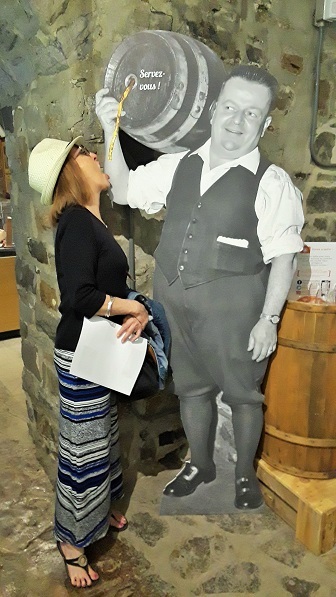 We also stumbled across an exhibit at L’Îlot des Palais about brewing that had taken place in the building as far back as 1668, and in more recent incarnations from 1852 to 1968 as, first, the Boswell Brewery, and by its demise as the Dow Brewery. But this current trip is something of a mission. 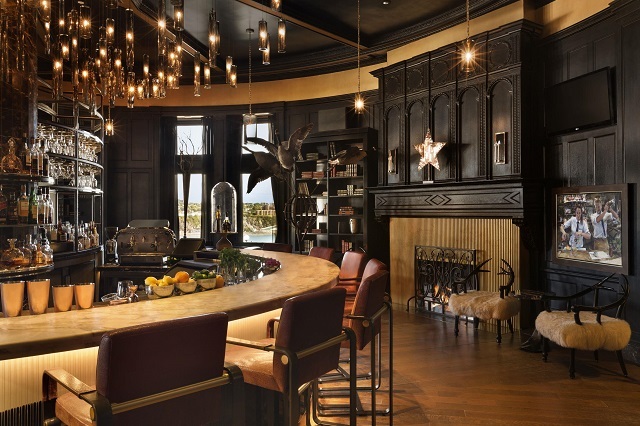 Aside from gathering information about Fairmont Le Chateau Frontenac, Lynn and I are going to head up to Charlevoix and try to repair the damage Trump wreaked during the recent G7 meetings there. We’re even staying at the same hotel where the meetings were held, the Fairmont Le Manoir Richelieu. I had hoped to find here in Quebec City a beer made by the Microbrasserie Charlevoix in Baie-Saint-Paul specifically with the meetings in mind, La G7. Made with ingredients from each of the seven participating countries, the beer is a strong lager at 7% ABV. But the brew appears to be sold out in these parts, and I had the able hand of the Frontenac concierge try to track it down for me. The odds will be better in Charlevoix and the plan remains the same: down as many La G7 beers as possible and say unprintable things about Trump after each one. Drinking locally, thinking globally. This story first appeared, in somewhat different form, in the Aug. 1, 2018 issue of The Commons, a weekly newspaper in Windham County, Vermont. Access the current edition of The Commons here.